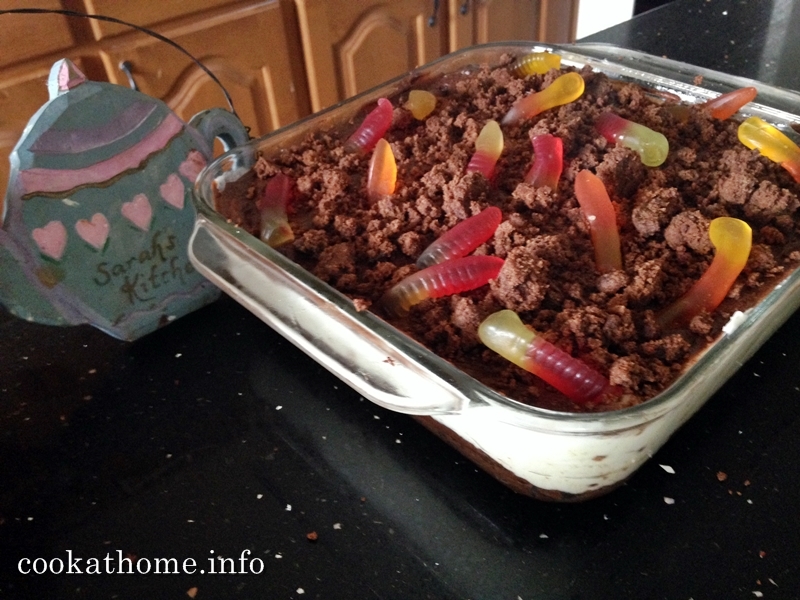 Ok, so anyone who knows us, knows that ‘Worms in the Mud’ is one of our favorite desserts. So much so, that when I asked Grant what he would like for a birthday cake one year, he wanted Worms in the Mud. The original recipe I posted ages ago and can be found here. As mentioned on that page, we found the recipe from a VeggieTales DVD. And have made it MANY times. The problem is that the original recipe is full of gluten and dairy components, using Oreo cookies and cream cheese, Cool Whip and milk for the instant pudding. I’ve managed to combat the gluten issues by using my chocolate peanut butter cookies as a base (recipe here), but it’s been a lot of trial and error to get the dairy components removed while still tasting awesome. I’ve found that instant pudding mixes are the savior – this recipe does use 3 packets of the stuff, as well as 3 tins of coconut cream, but the dessert IS meant to be shared between a high number of people. And it’s a special dessert that you wouldn’t make every day. So, it’s worth it. Trust me! 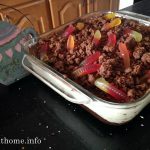 I recently took this to a friend’s house for dinner and she commented that this was was the best ‘dirt cake’ (obviously another name for what we call Worms in the Mud) that she had ever had, even with the gluten and dairy restrictions. You all have my permission to make either the original or this one. Or both! And let me know what you think in the comments section below! Preheat oven to 350F and prepare a baking tray with parchment paper or non-stick spray. Mix all ingredients except the coconut oil together in a medium bowl. Scoop 1 tbs balls and place on baking tray. Bake for 9 mins and allow to cool slightly. Measure 250g of the cookies and crush into crumbs (either in a food processor, or by hand in a Ziploc bag). Pour into a bowl and add melted coconut oil. Mix until the crumbs begin to stick together. Spoon into a 8x8" dish and press down to form a crust layer. Chill while making the other layers. Combine the pudding mixes and coconut cream together using a hand mixer. Pour over the top of the crust and chill while making the chocolate layer. Combine the pudding mix and coconut cream together using a hand mixer. Pour over the top of the white layer. Using some of the leftover cookies from the crust, crumble on top of the chocolate layer and add gummy worms as desired.